The 2016 Webinar Subscriber Summer Spectacular! Get ready for the 2016 Webinar Subscriber Summer Spectacular! It's our way of saying thank you to our webinar subscribers! We'll be sharing with you five new members-only series, released every two weeks, throughout the summer of 2016. Ireland's best-known genealogist, John Grenham, brings us the most comprehensive introduction to Irish research available online. John is the author of the genealogical standard Tracing Your Irish Ancestors. John gets you started with your Irish research in an approachable way that will take the mystery out of researching your Irish ancestors. If you enjoyed Thomas MacEntee's Microsoft Word series, you will love his new PowerPoint series. Thomas will take you through the steps of learning to use and make use of PowerPoint the right way. After you take this series of 10 classes, PowerPoint will make sense and you will be comfortable using it. DNA is a hot topic in genealogy right now but it can be a bit confusing to learn how it works. Unfamiliar with DNA? Not a problem! 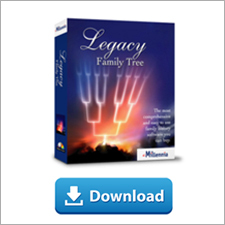 DNA expert Blaine Bettinger starts from the very beginning and helps give you an understanding of DNA so that you can apply it as a tool to your genealogy research. Did your ancestors Go West? Learn how to research your California ancestors with California native, Gena Philibert-Ortega. You'll tackle the major record groups and be on your way to uncovering details about your ancestors' California lives! In addition to the new summer series, you'll have access to all 363 classes in the Legacy Webinar Library including all the handouts! After the incredible findings of my first encounter with genetic genealogy, I am ready to take my DNA research to the next level. I want YOU – the live webinar audience – to be there with me as I explore GEDmatch.com for the first time. Since our Watch Geoff Live: DNA webinar in April, which some are saying was "the best overall DNA presentation [they've] ever caught..." I've tested the DNA of my father, his father, and my father-in-law. This really is the next big thing in genealogy! As has been suggested as the next logical step with genetic genealogy research, I've imported the data into GEDmatch.com, but am very unsure on how to interpret what it has found. 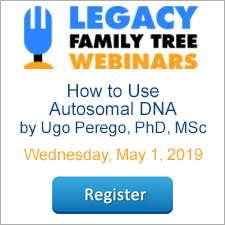 Once again, I've invited DNA expert, webinar presenter, and yourDNAguide.com's Diahan Southard to be on hand to guide, interpret and explain the findings. The result will be a live and unscripted session giving DNA neophyte researchers (like me) a first-hand look at what to expect from one of DNA’s key tools – GEDmatch.com. I'd love to share the experience with all of you (Friday, July 8, 2016) so please register for the live webinar here. Join us and Diahan Southard, for the live webinar Wednesday, June 29, 2016 at 2pm Eastern U.S. Register today to reserve your virtual seat. Registration is free but space is limited to the first 1,000 people to join that day. Before joining, please visit www.java.com to ensure you have the latest version of Java which our webinar software requires. When you join, if you receive a message that the webinar is full, you know we've reached the 1,000 limit, so we invite you to view the recording which should be published to the webinar archives within an hour or two of the event's conclusion. In my last blog post, I explained the benefits of creating a keyword list as a tool to help you organize your research. This however begs the question - How does using keywords lead to research success in genealogy? Using keywords can help researchers follow the paper trail and build the context around their ancestor’s life story. For continuity’s sake, I am sticking with the example that I used in the last post: the newspaper article about Capt. Bensley Collenette of Boston, Massachusetts. How do keywords lead you down the paper trail? I think of keywords as mental triggers. With experience follows greater intuition and the ability to point out that certain facts or keywords indicate there is more of a paper trail to follow. As an isolated example, this newspaper article provides several leads for more records. Capt. Collenette was noted to be a naturalized citizen of Boston, which suggests that his naturalization petition could be obtained and provide more genealogical information. In fact, in retrieving Captain Collenette’s petition for naturalization, the source offers a correction to the information in the newspaper article. Rather than being born in Germany, he was born on the Island of Guernsey, located in the English Channel. In the final sentence of the article, the writer noted the Captain ran a navigation school in Boston. When an ancestor is identified as operating a place of business, the city directories are a great source for finding more about the history surrounding a particular business or institution. Capt. Collenette’s qualifications for navigating and piloting ships offer clues to extending the paper trail. The article states that Captain Collenette was qualified as a master mariner in both England and the United States. The National Maritime Museum in Greenwich, England has custody of certificates for qualified Masters and Mates in the United Kingdom, but digitized copies are searchable on Ancestry.com. Masters of vessels in the United States required an official endorsement from the ship’s owner if a new master were to pilot that vessel. The ledger books containing endorsement of masters are held by the National Archives and Records Administration. I did locate Capt. Collenette among these records as the master of the steam yacht Myopia, allowing me to add one more kernel of information to the history of his seafaring life. You can mine the vast resources of the Internet, allowing you to locate some sources quickly. You can measure and analyze the appearance of a keyword. The article mentions various ships that Capt. Collenette served on, so using Google, I searched for these different ships. I was able to locate some history about these vessels, as well as some pictures. Using keywords in Google however takes some practice and playing around with the different terms. For example, in searching the names of vessels, you often have to precede the name with the type of vessel. Google is the type of search engine that works best when you communicate exactly what you’re looking for. Webinars by Lisa Louise Cooke and Thomas MacEntee offer great advice on how to use Google and other search engines for genealogy. Steam Yacht Lurline. Image Source: Library of Congress. Don’t overlook the search results in Google Books and Google Scholar. I found this method particularly helpful when I was looking up the occupation of steamboat inspector. Google had digitized copies of Annual Reports of Supervising Inspector General, Steamboat Inspection Service. While no mention of Capt. Collenette was made among these publications, I was able to learn a lot more concerning the nature and specific qualifications for the position. If there are famous people, noted officials or institutions mentioned in a particular source, extend your keyword search using catalogs like ArchiveGrid and Periodical Source Index. Using keyword searches in catalogs, I was able to locate papers for local steamboat inspector Andrew D. Burnham, U.S. Inspector General George Starbuck, and Edward Winslow, Collector of Customs for the Port of Boston. The keyword strategy can result in dead ends sometimes, but offers a methodical and calculated approach to seeking out other sources. When trying this type of research, it might be helpful to follow the trail of keywords mentioned in secondary sources. Sometimes, we are able to gather a lot more details and history if we generalize what we are looking for. A ship name might be too specific or offer only limited information, but if we broaden to a shipping line, like the Royal Mail Steam Packet Company, there are a lot more sources available for research. Analyzing all your sources for repetitions in keywords or subjects can definitely lead to more information. See what you can find using keywords in your research and let me know what you find! "United States, New England, Petitions for Naturalization, 1787-1906," images, FamilySearch (https://familysearch.org/pal:/MM9.3.1/TH-1951-34239-28679-49?cc=2064580 : 22 May 2014), Massachusetts > US Circuit Courts > US Circuit Court > Petitions for naturalization, 1874 Oct, vol 82 > image 357 of 430; citing NARA NAID 4752894, National Archives at Boston, Waltham, Massachusetts. “Records of Endorsements of Change of Master of Enrolled & Licensed Vessels, 1894-1914,” District of Boston, Massachusetts, Vol. 312, National Archives at Boston. A more complete collection of these reports is available through the Hathitrust Digital Library. Jake Fletcher is a professional genealogist, educator and blogger. Jake has been researching and writing about his ancestors since 2008 on his research blog. He currently volunteers as a research assistant at the National Archives in Waltham, Massachusetts and is Vice President of the New England Association of Professional Genealogists (NEAPG). The recording of today's webinar, "Digging Deeper in German Parish Records" by Gail Blankenau, is now available to view for free for a limited time at www.FamilyTreeWebinars.com. Continue your work in Germanic parish records, with examples and cases that will help you with an array of strategies and situations to help you learn how to bridge the gaps and build your Germanic lineage. If you could not make it to the live event or just want to watch it again, the 1 hour 46 minute recording of "Digging Deeper in German Parish Records" PLUS the after-webinar party is now available to view in our webinar library for free for a limited time. Or watch it at your convenience with an annual or monthly webinar membership. Church books are the “heart and soul of German genealogy.” Learning to read them is an important step in your research. Because Germany was not a unified country until 1871, there are many dialect words in these records. The longer you work in your particular parish, the more familiar you will become with your area’s usage. By now everyone knows that FamilySearch has a plethora of records online but did you know that there are a lot more records online that you can't readily see? If you just do a search on the Documents page you will miss them. If you do a search in the FHL card catalog you might just luck up and find a record set that has a link to images but since it hasn't yet been pulled into the indexing project you will not seen them in the list of records. For example, take a look at this -Deeds, 1786-1865; index to deeds, 1786-1913, Greenville County (South Carolina). Register of Mesne Conveyance. Scroll down on this page and the microfilms that have cameras next to them are accessible online as images. Click the camera and you will be taken right to the online images of the roll of microfilm. Join us and Gail Blankenau, for the live webinar Wednesday, June 22, 2016 at 2pm Eastern U.S. Register today to reserve your virtual seat. Registration is free but space is limited to the first 1,000 people to join that day. Before joining, please visit www.java.com to ensure you have the latest version of Java which our webinar software requires. When you join, if you receive a message that the webinar is full, you know we've reached the 1,000 limit, so we invite you to view the recording which should be published to the webinar archives within an hour or two of the event's conclusion. We're working hard to give our webinar subscribers the educational classes they need to maximize their genealogical research! All three of these new classes are bonus webinars in the webinar library. The webinar previews are always free. The Port of New York was the largest and perhaps most famous port of arrival for many of our immigrant ancestors. In this webinar, you will learn where to find New York passenger lists, what genealogy information they will provide, and tips and tricks for searching online records in the Ellis Island Database, the Castle Garden and FamilySearch websites, Ancestry.com, and other resources. Can't find your ancestors in New York Passenger Lists? Perhaps your immigrant ancestor arrived at another location. In this webinar learn how to locate and search for passenger lists for Boston, Baltimore, Philadelphia New Orleans, San Francisco, and Galveston, as well as other minor ports. Frustrated by the search for your immigrant ancestor's arrival record? In this webinar, learn some advanced tips and techniques for mining online passenger databases with tools such as Steve Morse's One-Step Web Pages, and how to find clues about an ancestor's immigration in other records such as censuses, port of departure lists, border crossing records, passport applications, newspapers, naturalization petitions, and more.